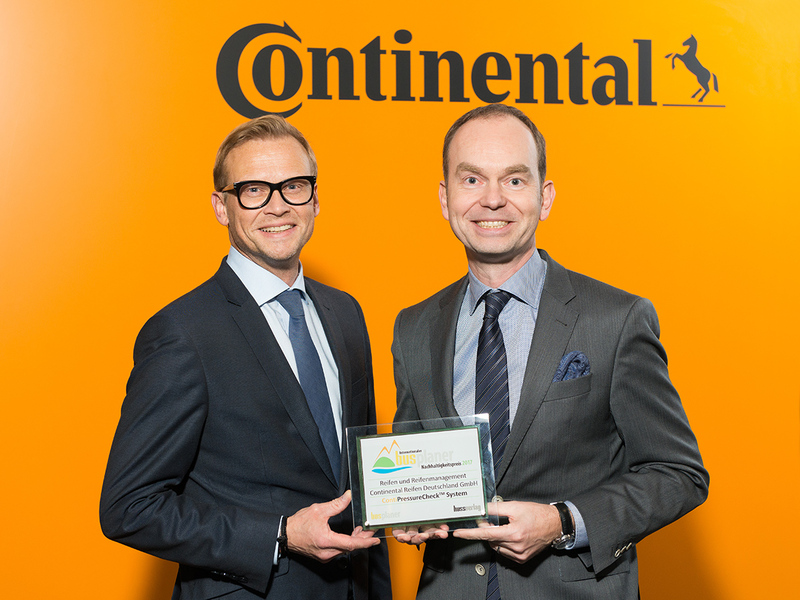 It is the second sustainability prize that Continental has received for its research and development services in passenger transportation. Having being recognized for the Conti Coach HA3 bus tires in 2015, the ContiPressureCheckTM system has been awarded busplaner’s "International Sustainability Prize 2017” in November 2016. The independent jury, made up of seven representatives from the fields of economy, science, trade associations, and media, was impressed by the holistic approach of the "ContiPressureCheckTM" (CPC) automated tire-pressure monitoring system from Continental. "On the one hand, the air pressure monitoring system preserves resources and reduces the emissions caused by unnecessary wear to the tires; on the other hand, the solution lowers the annual fuel consumption.” And there’s more: "At the same time, the road safety of the tires is increased by the continuous monitoring of air pressure, which benefits our society directly." R&D services were also praised: "Continental continuously goes beyond the current product development status by investing in research into 'Green tires' and operates on the basis of a comprehensive environmental management system in the long term." Dr. Marko Multhaupt, head of Marketing and Sales, Continental, (left) accepts the busplaner "Sustainability Prize 2017" from Thomas Merz, from Huss-Verlag publishers, in Hanover: "I'm delighted that Continental's commitment to improving environmental performance has been recognized in this way." CPC was introduced onto the market for the first time in 2013 and has now been tried and tested in Europe a thousand times over. Its function is essentially based on two measurements: A sensor in the tire continuously sends information regarding the tire pressure and tire temperature to an independent display in the cab, so that the system can also be integrated into the vehicle electronics. Now that the CPC sensors are installed in the factory, a key component of the new "ContiConnect" tire information and management system, iTire, has been introduced in 2016. In this way, the tires of an entire fleet can be monitored in real time. Once the tire values reach a critical level, as a result of damage for example, iTire notifies the driver and the fleet manager of this via ContiConnect. They can then call out a breakdown company or arrange a service through a 360° service partner, for example. This keeps the vehicles on the road and improves the efficiency of the entire bus fleet. The continuous monitoring of tire pressure reduces tire wear and improves environmental performance. The "International Sustainability Prize" from busplaner recognizes companies and products that use suitable strategies and measures to confront the challenges of global sustainability in the omnibus and group tourism industry.